There was a similar type of no-refund situation within the TNCF/Curaco FIR but we now understand after some noise, operators are getting refunds as per normal industry practice. 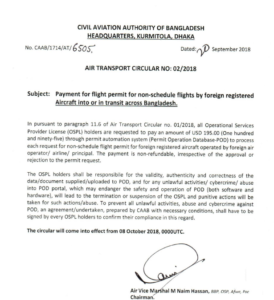 We say it’s time for the CAA in Bangladesh to stop this non-refundable nonsense. Have you had a permit denied and not received your money back? Reach out and Let us know!